Squeezing out the toothpaste is a term sometimes used when a group is seemingly squeezed, but in reality is forced into a direction where it should have been stopped, in particular into the territory of the player doing the 'squeezing'. Squeezing out the toothpaste is an application of the general idea of pushing through small gaps. One classical example of squeezing the toothpaste is illustrated in this sequence. 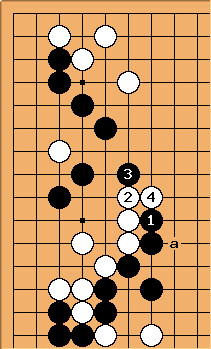 All of White's moves are perfectly natural, but , , send White squeezing through the small gap between and , weakening both the chain and the chain. One possible alternative for Black: Black , White , Black , White , Black a. Black plays to strengthen his group, then to prevent the cut. Now he has weakened his center group more than he helped it. One can argue whether is necessary. 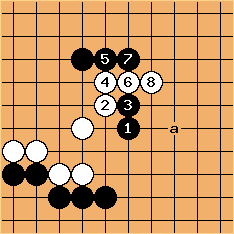 But if Black wants to play it, he should play there directly, without the / exchange. (Leading to at , at , at a). In Teach Yourself Go Charles Matthews introduced the idea of failing ladder, which is the same but with corners in the toothpaste.